Do you remember when birthday parties were just a few close friends? When Moms simply served hot dogs, baked beans, potato chips (a treat), and cake and ice cream?? When presents were maybe a book or inexpensive toy? Everyone's birthday party was similar? No one tried to "top" anyone else? Not only do I remember, I wish we were still living in those times! Happy days! Oh, I do remember as a young teenager we could take a friend or two to the local movie theater instead of a party and maybe even instead of a present. That was fun as we went at night and thought we were so grownup. All our birthdays were simply family dinners. Only once did I have a party, and that was a surprise party my married sister threw for me when I turned 17. I raised our children the same way. Only one party with friends during their growing up years. They all turned out great! I remember we celebrated all the cousin's birthdays on my mom's side, individually. The mother of the birthday person would make a cake, and one of my aunts would also make her famous angel food cake with coconut frosting. 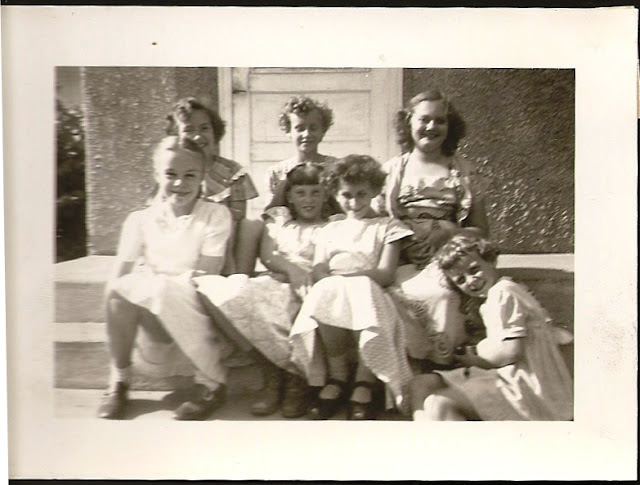 We would have a simple lunch, play all together, the birthday kid would open gifts and have the cakes and ice cream, sometimes homemade ice cream. Your photo could be a photo from my childhood. Amazing isn't it that we all did just fine without a blowout party! Life really was simpler when it wasn't all about the kids. Happy late birthday. I hope you had a very good one. I had only one birthday party as I recall, for my tenth. Three friends came; we played games on the lawn and had cake and I expect I got over-excited and giggly. I still have the book that one of the friends brought me. I also recall a couple of parties I attended - playing "pin the tail on the donkey" at one; the other was a picnic in a local park, I was only four but I still remember the pale blue sugar roses on the birthday girl's cake. And I think we made daisy chains. Yes, makes you wonder what happened to just enjoying the simple things. Nowdays it seems things are so overblown and things like a simple birthday become a production. Ten year old girls are supposed to be giggly! But a friend's moms threw the most memorable birthday parties for her kids. Lunch was always hot dogs and potato chips and your choice of SODA (so fancy!). Mrs H. dreamed up lots of fun games (who could eat a soda cracker and be the first to whistle, dropping clothes pins into mason jars, pin the mustache on the movie star, be the first to blow a 5-inch bubble with a piece of Bazooka bubble gum (that stuff was so hard to get going! ), potato sack race (with real burlap potato sacks), 3-legged race, wheelbarrow race, eating marshmallows on a string with your hands behind your back. And she had a prize for each game! At the end of the games we would all get a kazoo. Then we would play "Happy Birthday" as the cake was brought out. Her mom made such beautiful, fancy layer cakes crammed with frosting. I always felt so lucky to be invited to her party each year.